Keeping up with the theme I began last week, this week I'll share a little about the Honor Pullover, from my new book—Finish-Free Knits! Beginning with stitches cast on for the outer edge of the collar, short-rows are used to shape the ribbed collar and V-neck as stitches are increased along raglan lines for the yoke of this flirty pullover. The body and sleeves are worked in rounds to the lower edges. A bit of waist shaping and elongated ribs add style to this wear-everywhere pullover. Honor was born one afternoon when I wanted to see if it would be possible to design a top-down sweater with a collar and begin at the edge of the collar! I wanted the pattern to be as simple as possible to follow, so I drew out a chart in Adobe Illustrator for each size and was able to write the pattern in a manner that does not include any "and at the same time" instructions. I try to do this whenever possible throughout the book, because it's something I'll often overlook in a pattern and need to end up ripping back—even with my own designs. I was sure to knit this sample myself because I really wanted to be sure I worked out any unanticipated kinks that might show up while working the collar or neck. And there were a few that popped up! I realized that the back neck stitches needed to be bound off for this sweater (as is important with many sweaters). Without the back neck stitches bound off the neckline stretched out and fell over the shoulders. Also, an odd gap formed at the center of the front V-neck that I had to come up with a clever way to remedy. But you won't have to worry about any of that stuff! It's all included in the pattern now. 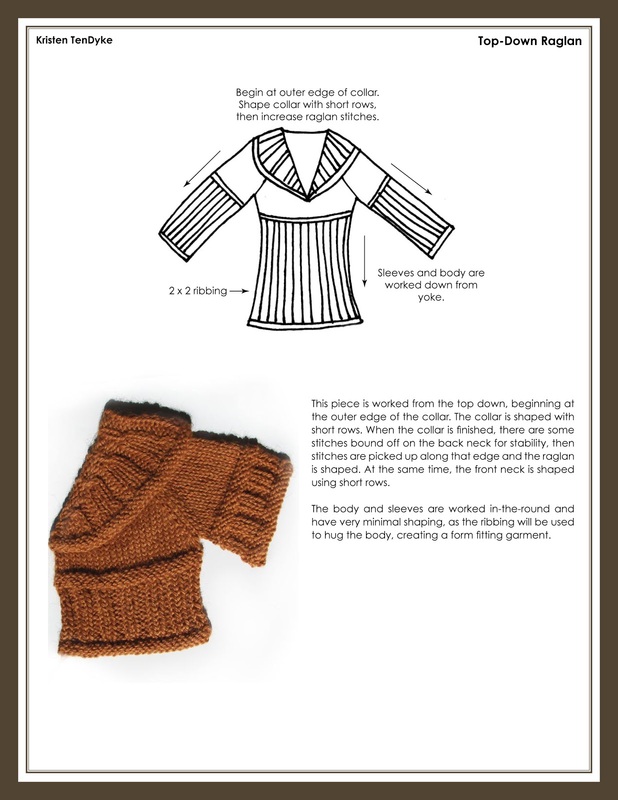 There are a lot of short rows for the collar and neck shaping, but each one is written out for you to follow and there are illustrations and instructions on how to do short rows in the Glossary. Once the neck shaping is completed, it's smooth sailing throughout the rest of the body and sleeves! If you're eager to get started on this sweater, Green Sheep Shop has this yarn on sale for 20% off throughout November! See all the posts about Finish-Free Knits. For YEARS i have wanted someone to design a book of beautiful patterns that were REALLY seamless. There are several disappointing books out there that purport to be seamless but may only have one or two seamless patterns. i can't wait to get your book in my hands!! Your patterns look AMAZING! Redgrrl, that's so great to hear! I'm must have picked up on your "asking" :D I hope you enjoy!